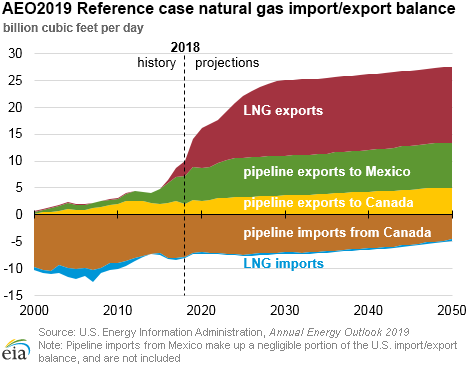 EIA’s recently released Annual Energy Outlook 2019 (AEO2019) Reference case projects continued growth in U.S. dry natural production and exports through 2050 as domestic natural gas prices remain relatively low and stable. 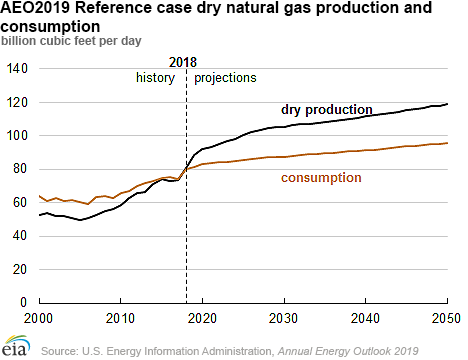 U.S. dry natural gas production is forecast to grow by 23% from 75 billion cubic feet per day (Bcf/d) in 2017 to 92 Bcf/d in 2020, according to the most recent Short-Term Energy Outlook (STEO). In the AEO2019, the rate of production growth is projected to slow after 2020 but remain positive through 2050, when production reaches 119 Bcf/d. 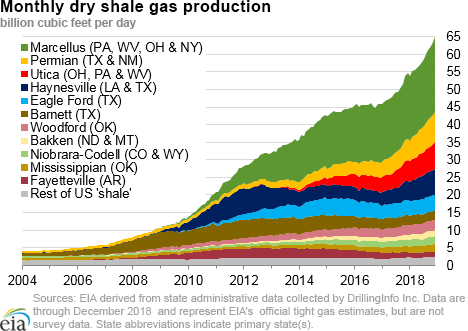 Dry production growth is expected to outpace U.S. consumption of natural gas. Although consumption is also projected to grow through 2050, it does so at a slower rate than dry production. Natural gas consumption in 2050 is expected to be 96 Bcf/d, up from 74 Bcf/d in 2017. Natural gas that is produced but not consumed domestically is exported, and the largest growth in exports is from liquefied natural gas (LNG). U.S. LNG exports are projected to increase from an average of 2 Bcf/d in 2017 to 14 Bcf/d by 2030. Much of the increase in LNG exports (8 Bcf/d) occurs between 2017 and 2023 as new LNG export facilities come online. U.S. natural gas pipeline exports to Mexico and Canada are also expected to increase through 2050. Exports to Mexico will grow from 5 Bcf/d in 2017 to 8 Bcf/d in 2050. Net imports from Canada will decrease as the United States exports more natural gas to Canada while importing less, particularly from western Canada. The net flow of natural gas between the United States and Canada is expected to change to net exports toward the end of the projection period as U.S. export volumes exceed import volumes from Canada. This growth in production, consumption, and exports comes as U.S. natural gas prices are expected to remain relatively low and stable through 2050. The annual average Henry Hub spot price is expected to remain lower than $4.00 per million British thermal units (MMBtu) in real 2018 dollars through 2034 in the Reference case, and not to exceed $5.00/MMBtu by 2050. 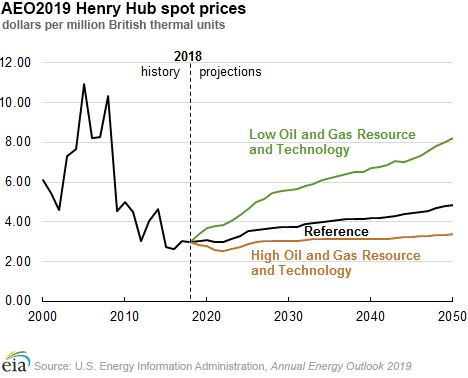 The range of Henry Hub natural gas spot prices in the AEO2019 is defined by the resource and technology side cases, indicating that assumptions about technically recoverable resources and costs drive the projections. The High Oil and Gas Resource and Technology side case projects lower prices that remain lower than $4.00/MMBtu through the projection period. The Low Oil and Gas Resource and Technology case projects steeper growth, with prices reaching $4.00/MMBtu by 2023 and exceeding $8.00/MMBtu by 2050. The AEO2019 presents long-term projections of energy supply, demand, and prices through 2050. It includes a Reference case that assumes laws and regulations remain in force in their current form throughout the projection period, as well as alternate scenarios that incorporate different assumptions about macroeconomic factors, technology and resource availability, and oil markets. Natural gas spot prices rose at most locations this report week (Wednesday, January 23 to Wednesday, January 30). However, Henry Hub spot prices fell from $3.10/MMBtu last Wednesday to $2.96/MMBtu yesterday. At the NY Mercantile Exchange (Nymex), the February 2019 contract expired Tuesday at $2.950/MMBtu, down 3¢/MMBtu from last Wednesday. The March 2019 contract decreased to $2.854/MMBtu, down 7¢/MMBtu from last Wednesday to yesterday. The price of the 12-month strip averaging March 2019 through February 2020 futures contracts climbed 2¢/MMBtu to $2.946/MMBtu. Net withdrawals from working gas totaled 173 Bcf for the week ending January 25. 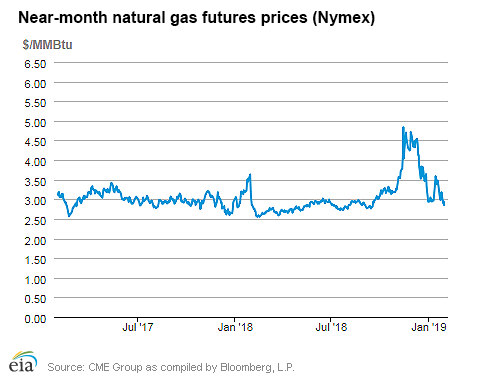 Working natural gas stocks are 2,197 Bcf, which is 1% lower than the year-ago level and 13% lower than the five-year (2014–18) average for this week. 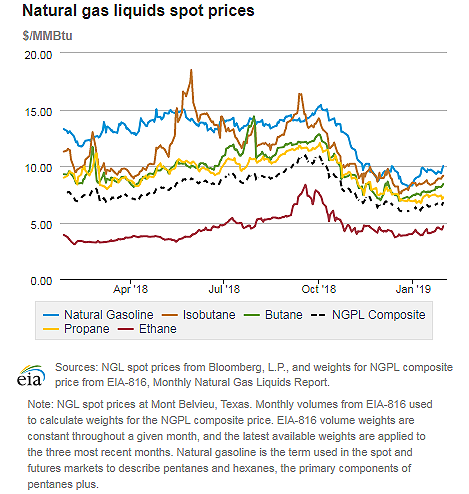 The natural gas plant liquids composite price at Mont Belvieu, Texas, rose by 16¢/MMBtu, averaging $6.67/MMBtu for the week ending January 30. The price of propane fell by 2%. The price of natural gasoline, ethane, butane, and isobutane rose by 1%, 8%, 4%, and 5%, respectively. 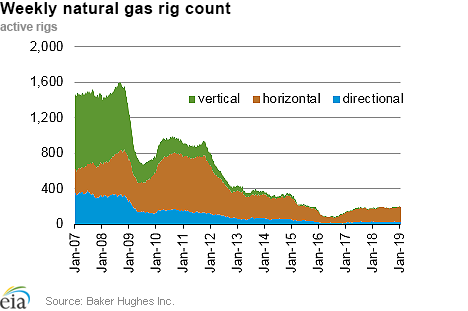 According to Baker Hughes, for the week ending Tuesday, January 22, the natural gas rig count decreased by 1 to 197. The number of oil-directed rigs rose by 10 to 862. The total rig count increased by 9, and it now stands at 1,059. Prices in regional markets rise with historically cold weather. This report week (Wednesday, January 23 to Wednesday, January 30), Henry Hub spot prices fell 14¢ from $3.10/MMBtu last Wednesday to $2.96/MMBtu yesterday. A polar vortex blanketed the Midwest and Northeast at the end of the report week (January 29–31), bringing historically low temperatures and snow. 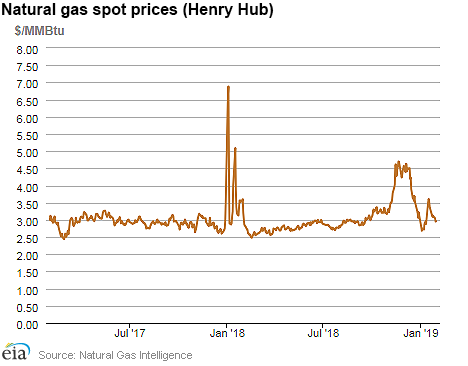 Despite this, the Henry Hub prices traded within a relatively narrow range of 17¢, reaching a weekly high of $3.12/MMBtu on Thursday. At the Chicago Citygate—the most heavily affected major trading hub—prices increased $1.88 from $3.11/MMBtu last Wednesday to $4.99/MMBtu yesterday with a weekly high of $7.46/MMBtu on Tuesday. Polar vortex prompts utility companies to ask customers to conserve natural gas. Consumers Energy—which supplies natural gas to 4.1 million Michigan customers—issued a notice on Wednesday, January 30 asking industrial and residential/commercial customers to temporarily reduce natural gas consumption during the cold weather event and following a fire at a natural gas compressor station in Southeastern Michigan (Macomb County). As a result of the request, General Motors halted operations at 11 Michigan plants to conserve natural gas. Residential and commercial users were asked to set thermostats to 65 degrees Fahrenheit to ensure deliverability to critical facilities such as hospitals. Several other Midwestern utility companies are citing strains on their natural gas systems and electricity grids, and they are asking customers to conserve energy. Xcel Energy, an electric and natural gas utility holding company that serves approximately 437,000 natural gas consumers in Minnesota, issued similar conservation requests to customers because extremely cold temperatures have led to loss of natural gas service in Princeton, Minnesota. ComEd, the utility company serving nearly 4 million customers in the Chicago area, reported 9,000 power outages on Wednesday, January 30. Prices rise sharply in Northeastern cities during the polar vortex. At the Algonquin Citygate, which serves Boston-area consumers, prices went up $5.57 from $3.53/MMBtu last Wednesday to $9.10/MMBtu yesterday after reaching a weekly high of $10.04/MMBtu on Tuesday. At the Transcontinental Pipeline (Transco) Zone 6 trading point for New York City, prices increased $9.53 from $2.98/MMBtu last Wednesday to their weekly high of $12.51/MMBtu yesterday. According to the Transcontinental Gas Pipeline Company, the Transco pipeline—running from Texas to New York City—issued an operational flow order on Wednesday to ensure system integrity. Tennessee Zone 4 Marcellus spot prices increased 16¢ from $2.76/MMBtu last Wednesday to $2.92/MMBtu yesterday. Prices at Dominion South in southwest Pennsylvania rose 22¢ from $2.72/MMBtu last Wednesday to $2.94/MMBtu yesterday. Prices in California are mixed. Prices at PG&E Citygate in Northern California rose 11¢, up from $3.60/MMBtu last Wednesday to $3.71/MMBtu yesterday. Prices at SoCal Citygate decreased 11¢ from $4.16/MMBtu last Wednesday to $4.05/MMBtu yesterday. Discount at Permian Basin trading hub persists. Prices at the Waha Hub in West Texas, which is located near Permian Basin production activities, averaged $2.14/MMBtu last Wednesday, 96¢/MMBtu lower than Henry Hub prices. Yesterday, prices at the Waha Hub averaged $2.37/MMBtu, 59¢/MMBtu lower than Henry Hub prices. Supply remains flat. 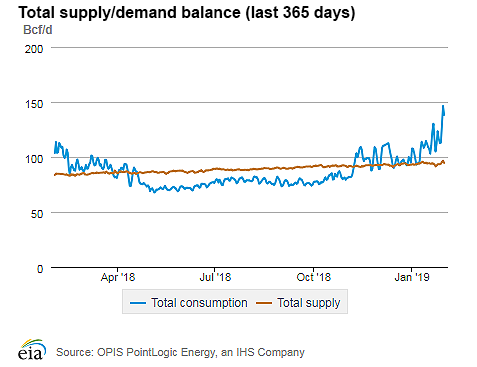 According to data from PointLogic Energy, the average total supply of natural gas remained the same as in the previous report week, averaging 94.0 Bcf/d. Dry natural gas production remained constant week over week. Average net imports from Canada increased by 7% from last week amid cold weather. Demand rises, driven by the residential/commercial sector. Total U.S. consumption of natural gas rose by 8% compared with the previous report week, according to data from PointLogic Energy. In the residential and commercial sectors, consumption increased by 11%, reaching a near-record high of 70.9 Bcf/d on Wednesday, January 30, the second-highest value ever recorded (the highest was 71.6 Bcf/d in January 2014). Natural gas consumed for power generation climbed by 6% week over week. Industrial sector consumption increased by 4% week over week. Natural gas exports to Mexico increased 3%—averaging 4.9 Bcf/d—reaching a record weekly high, according to Genscape. Despite decreased natural gas feedstock deliveries, U.S. LNG exports increase week over week. Seven LNG vessels (six from Sabine Pass and one from Cove Point) with a combined LNG-carrying capacity of 25.5, Bcf, departed the United States between January 24 and January 30, and one vessel was loading at Sabine Pass terminal on Wednesday, according to shipping data compiled by Bloomberg. Natural gas feedstock deliveries to U.S. liquefaction facilities have decreased during the past two weeks and averaged 3.9 Bcf/d, compared with an average 4.9 Bcf/d from January 1 to January 15, according to data from PointLogic Energy. The Corpus Christi terminal has not had any feedstock deliveries since January 20, when the facility exported its first five commissioning cargoes. Cameron LNG export terminal filed a request with the Federal Energy Regulatory Commission on January 25 to introduce hazardous fluids and commission the OSBL (outside battery limits) flare header system as part of the commissioning activities at the facility. Cameron LNG is located in Hackberry, Louisiana, and has three trains under construction, each with a baseload capacity of 0.6 Bcf/d. Net withdrawals from storage totaled 173 Bcf for the week ending January 25, compared with the five-year (2014–18) average net withdrawals of 150 Bcf and last year's net withdrawals of 126 Bcf during the same week. Working gas stocks totaled 2,197 Bcf, which is 328 Bcf lower than the five-year average and 14 Bcf lower than last year at this time. According to The Desk survey of natural gas analysts, estimates of the weekly net change from working natural gas stocks ranged from net withdrawals of 180 Bcf to 202 Bcf, with a median estimate of 189 Bcf.